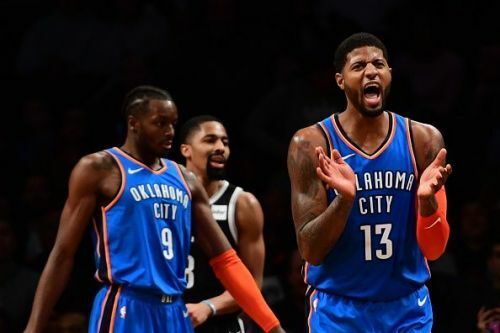 The Oklahoma City Thunder pulled off an incredible comeback win against the Brooklyn Nets last week, which made many around the NBA take notice. The Thunder outscored the Nets by 20 points in a fourth quarter, fuelled by a monstrous effort from Paul George. PG13 scored 25 points in the quarter and his season-high total of 47 was instrumental to the Thunder winning a fourth consecutive game. Billy Donovan's team have now won nine of their last twelve games, and after a 0-4 start to the season, the Thunder now sits top of the Western Conference standings. There is currently an air of confidence around the organization, and the Thunder are still buzzing thanks to Paul George's decision to commit his peak years to the franchise, and the team has also been boosted in recent weeks by Russell Westbrook's return to fitness. With the Houston Rocket falling apart this season, the Thunder may prove to be the Golden State Warriors biggest competitors in the postseason, and here are three reasons why the Warriors should be concerned about the Thunder. Andre Roberson may be one of the worst offensive players in the NBA, although he more than makes up for this, thanks to his incredible ability on the defensive end. Last season when the Thunder had a starting lineup of Russell Westbrook, Andre Roberson, Carmelo Anthony, Paul George, and Steven Adams, the team had a huge +14.5 net rating. 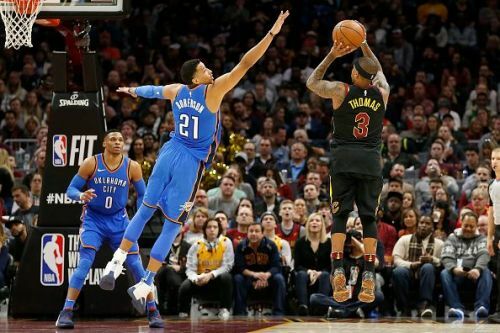 Despite Roberson missing the entire campaign so far, the Thunder already have one of the best defensive ratings in the NBA, and Roberson's return in February will further add to the team's defensive resolve. The 27-year-old will also have a full three months to get into peak condition for the playoffs, so he could prove to be the team's secret weapon in May.